Years in the making, Pablo Neruda’s massive and enduring Canto General is a veritable modern epic of Latin America, an imaginative, fifteen-part cultural journey through the centuries-long histories and (post-)colonial challenges of the region. The unique poetic artistry of this foundational work by the Chilean Nobel laureate in literature, which includes the much heralded The Heights of Macchu Picchu, finds a sure English-language voice in Mariela Griffor’s impressive and re-translation. Griffor’s handling of Neruda’s stylized imaging lends this communal celebration of pan-American identity—packed with flora, fauna, battles, conquistadors, and political meditations—the steadying, colloquial diction noticeably wanting in many earlier renderings of Neruda’s work. "Pablo Neruda created his masterpiece Canto General from 1938 until 1950. . . Mariela Griffor's translation, however, is only the second English translation of the entire Canto General. (The first was in 1993 by Jack Schmitt.) Given the prestige of the work and its sheer length, it's no surprise that more translators have not taken on the task. For this alone, Griffor is to be applauded. It should also be noted here that this edition of the Canto appears only in English not in a bilingual edition and it's easy to understand why since a Spanish-English version would have clocked in at over 1,000 pages.
. . . The (translator's) introduction alone offers interesting reading. But in the text itself, the translator also makes Neruda's verses sing for the reader. . . Consider the beauty of the single line in the same opening section: 'All is silence made of water and wind' (21). Though beautiful in Neruda's Todo es silencio de agua y viento, the alliteration in English makes it even more wonderful. . . .Griffor serves up her reader dozens and dozens of such gorgeous lines, stanzas, and poems 'transcreated' from Neruda and her work is truly worth serious attention from the reader." Click here for more on this essential new translation! National Translation Award Shortlist: PoetryJudges in poetry this year are Ani Gjika, Katrine Øgaard Jensen, and Gregory Racz. Great News! Canto General was shortlisted for the National Translation Award in Poetry! 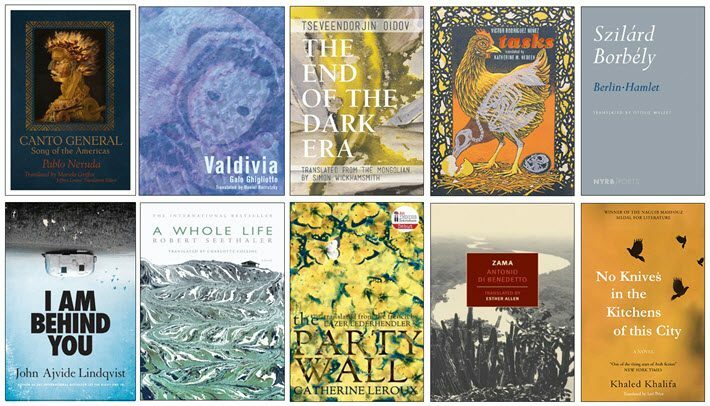 Of the 10 shortlisted titles for the National Translation Award, only one–John Ajvide Lindqvist’s ‘I Am Behind You’ (Text Publishing)–does not give cover credit to its translator, Marlaine Delargy. And in Women in Translation month, we see that in poetry, the translation work of three women and two men is shortlisted; in prose, four women and one man.–Porter Anderson. This summer, 2015, has been a summer of surprises and big changes. Not only have I moved (or at least I will be living between two zip codes, Michigan and Washington D.C.) but also I got a new desk, which is quite modern, quite small, and greatly practical. The best desk I have had in years! I’m sure I will be able to keep up with the fierce discipline of my many new media writer friends. The distractions are many but I’m still good with deadlines and that is my best friend these days.